Addressing the needs of a community can take many forms, and sometimes when we dig a little below the surface, we get to the roots. This holds true for Community Grows, a non-profit in the Western Addition, whose mission is “to cultivate healthy youth through growing gardens in low-income, diverse communities.” Justin Pearson ’20, graduate student in the MA Urban & Public Affairs program, recently visited Community Grows and spoke with its director and staff. 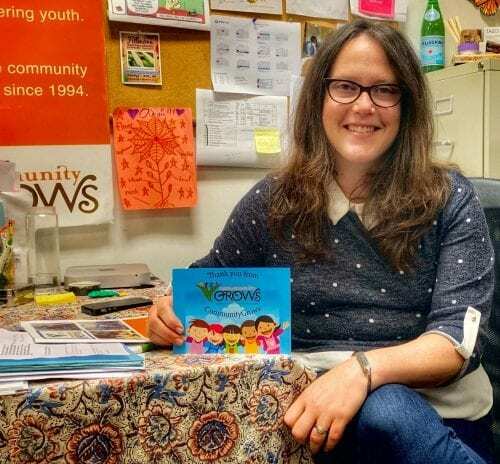 For Director Kelly ErnstFriedman, Community Grows has seen a natural evolution since its establishment in 1994. She noted that founder, Barbara Wenger initially just wanted a place for her son to play in the park. Through a collaboration with the Western Addition’s Mo’Magic, the joint concern for the youth has expanded to an initiative steeped in community outreach, research and service learning. 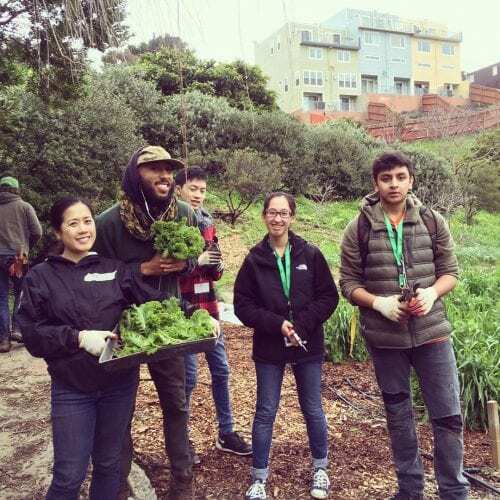 USF students, through the McCarthy Center’s Engage San Francisco, have benefited from the values of service learning, engaging communities for good and and of course the value of healthy eating. In the past, Engage has partnered with Community Grows at the New Liberation Community Garden where students tilled the soil and feasted on their hard work. Additionally, through the “Rhetoric of Caring” course through the Department of Rhetoric & Language, students have partnered in teaching outdoor science education to children K-8. How can you help? Guess what – being the “outdoorsy” type isn’t a necessity! Community Grows is always seeking experience in mentorship, classroom management and online systems — all towards the common goal of working with the Western Addition. Community Gardens are more than just urban agriculture. They are a means of independence for the communities they serve. Kelly ErstFriedman speaks of this and the wider reach of the programs at Community Grows, elaborating on its impact on youth development, especially low income youth of color. Environmentalism has typically not been central in the community, simply due to people not feeling a part of it. The work of Community Grows and their partnerships expose the need for greater engagement with communities on a granular level, while emphasizing the value in effective collaboration. Read more on the work of Community Grows, and when their next events take place! This entry was posted in Academic Year 2018-2019, community engaged learning, Community Partners, Engage San Francisco, Leo T. McCarthy Center (LTMC), Master of Urban and Public Affairs, Uncategorized, University of San Francisco. Bookmark the permalink.